A seasoned pro can make reasonably informed guesses about what a given target audience will respond to. It’s the starting point of any new campaign. And by watching analytics, we can measure just how good those informed guesses are. But even if your marketing team’s initial guesses exceed your conversion goals, this is only your starting point. Odds are, you didn’t master the optimization of every detail of the campaign on the first shot. Even if you’re happy enough with your conversions and ready to call it good, consider this: An audience’s responses change over time as it grows and evolves. What works for you now may not work so well next year. It’s not enough to continue to do what’s worked in the past. That’s where iteration comes in. Iteration is the process of making continuous improvements to your website and outreach efforts to optimize your conversion rates. This is done through watching trends in your analytics and split testing. It’s not something you do once to kick the tires of a new call-to-action page, either—it’s a critical best practice that should be part of your strategy on an ongoing basis. 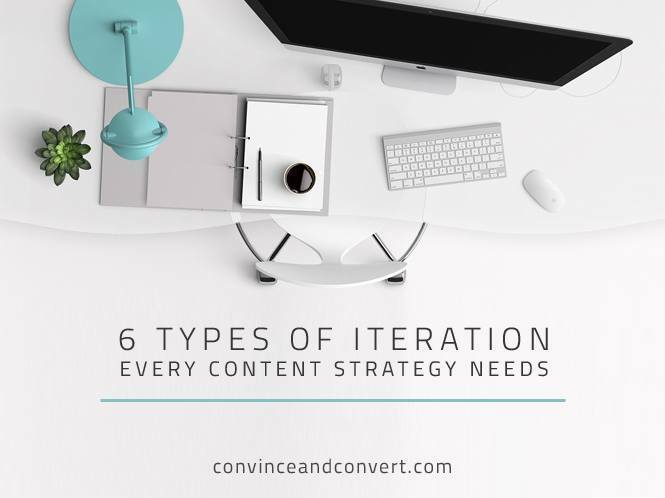 In fact, there’s six different ways every content team should iterate on an ongoing basis. What day of the week will your readers engage most with your content? What time of day? Perhaps it’s Monday morning when they’re tackling their inboxes after the weekend, or maybe it’s Friday afternoon when they’re burned out from the week. Maybe it’s 2 a.m. on Saturday when they’re taxiing home from the clubs. How do you find those optimal sweet spots with your social media followers? Only way to do it is to try several different times and keep an eye on the results over time. When you find times that get consistent rises in engagement, hold onto them. (Until even bigger sweet spots are found, of course). There’s plenty of studies that suggest typical frequency trends. According to Buffer’s 2015 findings, the optimal return on Twitter comes at three posts a day. But don’t let mass user trends dictate your strategy—every audience is different. Instead, consider it a starting point for informed guesses. Then, watch the data, and test on your own to determine what your audience responds to. What happens if you place a video on your landing page instead of an image? Or if you release a podcast instead of a blog post? Why not try and find out? Then, if something gets a good response, throw it into the rotation more frequently, and see if that positive response becomes a trend. The layout of a page can be immensely powerful. From the image a web page features to the placement of the email subscription form, it can all influence conversion rates. But how do you know what image will resonate with your users best and convert to the best results? Iteration, particularly through split testing, can help create a more optimized web page. The call to action is arguably the most important thing on your website, and one that has been obsessed over by many a marketing pro. From finding the best wording right down to the color of the button, it’s all been analyzed in article after article. But will your audience respond as well to an orange button in 2016 as ConversionXL’s case studies did in 2013? You can only find out by trying it out—along with a few other colors. The incentive a web page uses to drive conversions can make a big different for signups too, whether the goal is email subscribers or purchases. There’s many different ways to incentivize. You can offer a free ebook, a discount, behind-the-scenes insider information, or a free trial period, just to name a few. When testing incentives, don’t just look at new subscribers. Look for long-term loyalty with metrics on unsubscribers, email opens, and repeat buys. When starting from scratch on a new campaign, use those general trends about online user behaviors to inform you, as well as your best informed guesses about your target audience. But keep your mind and your eyes open—your audience’s actual behavior trends may surprise you! That’s where the iteration comes in. You don’t need to have all six of these iteration types running all at once—just keep an eye on all of these aspects of your campaign, from the landing page to social media posts, and always be looking to discover another way to hone and improve. Whatever you do, do something. In a digital world, audience trends are in constant flux. To go on doing what’s worked in the past is to fall behind. If you make small improvements consistently, even if each of those changes only boost your conversion rate a percent or two, over time, those percents add up to an incredible conversion rate for your campaign.